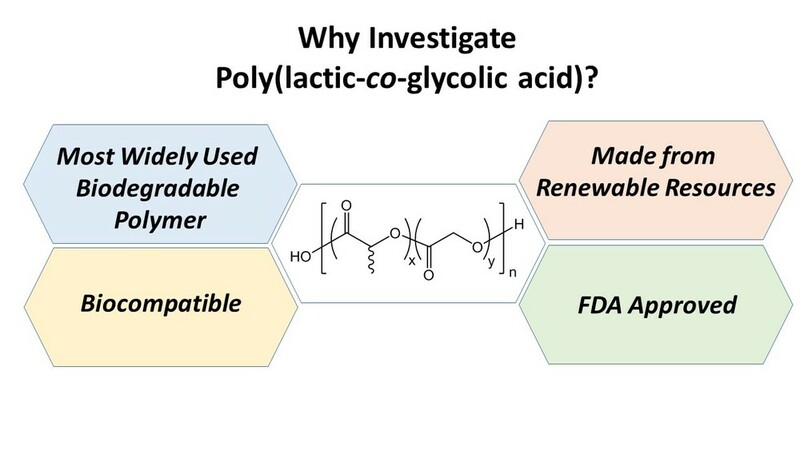 The PLGA Group of the Meyer Lab works on synthesizing new repeating sequence copolymers (RSCs) of lactic acid (R & S isomers) and glycolic acid. Our group is particularly interested in exploring how sequence effects the properties of these materials. Properties including conformation, hydrolysis profile, and morphology were found to depend on sequence. We are currently examining these materials for possible bioengineering applications. Synthetic methods and monomer pools are being expanded as the interest in sequenced polymers itself expands. Short, A. L.; Fang, C; Nowalk, J.A. ; Weiss, R.M. ; Liu, P.; Meyer, T.Y., Cis-Selective Metathesis to Enhance the Living Character of Ring-Opening Polymerization: An Approach to Sequenced Copolymers. ACS Macro Letters 2018, 7(7): 858-862. Washington, M. A.; Balmert, S. C.; Fedorchak, M. V.; Little, S. R.; Watkins, S. C.; Meyer, T. Y., Monomer sequence in PLGA microparticles: Effects on acidic microclimates and in vivo inflammatory response. Acta Biomaterialia 2018, 65, 259-271. 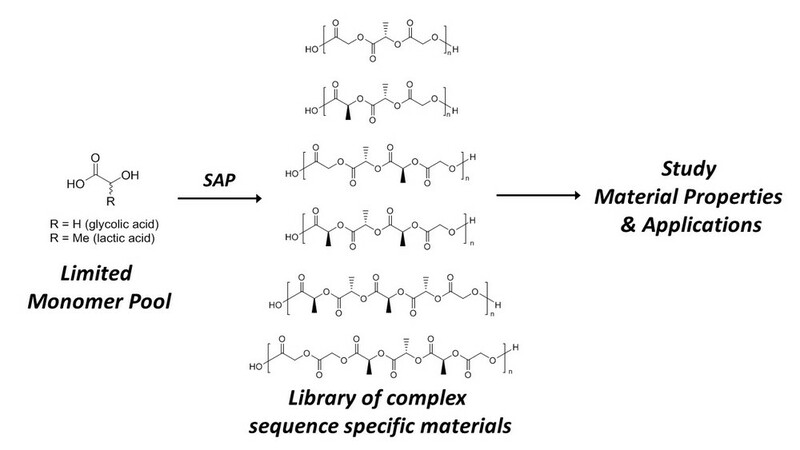 Washington, M. A.; Swiner, D. J.; Bell, K. R.; Fedorchak, M. V.; Little, S. R.; Meyer, T. Y., The Impact of Monomer Sequence and Stereochemistry on the Swelling and Erosion of Biodegradable Poly(Lactic-Co-Glycolic Acid) Matrices. Biomaterials 2017, 117, 66-76. Weiss, R. M.; Li, J.; Liu, H. H.; Washington, M. A.; Giesen, J. A.; Grayson, S. M.; Meyer, T. Y., Determining Sequence Fidelity in Repeating Sequence Poly(Lactic-Co-Glycolic Acid)S. Macromolecules 2017, 50 (2), 550-560. Weiss, R. M.; Short, A. L.; Meyer, T. Y., Sequence-Controlled Copolymers Prepared Via Entropy-Driven Ring-Opening Metathesis Polymerization. Acs Macro Letters 2015, 4 (9), 1039-1043. Jian, L.; Michael, A. W.; Kerri, L. B.; Ryan, M. W.; Sam, N. R.; Steven, R. L.; Harry, M. E.; Tara, Y. M. In Sequence-Controlled Polymers: Synthesis, Self-Assembly, and Properties; American Chemical Society: 2014; Vol. 1170, p 271-86. Li, J.; Rothstein, S. N.; Little, S. R.; Edenborn, H. M.; Meyer, T. Y. "The Effect of Monomer Order on the Hydrolysis of Biodegradable Poly(Lactic-Co-Glycolic Acid) Repeating Sequence Copolymers," Journal of the American Chemical Society 2012, 134, 16352-59. DOI: 10.1021/ja306866w. Weiss, R. M.; Jones, E. M.; Shafer, D. E.; Stayshich, R. M.; Meyer, T. Y. 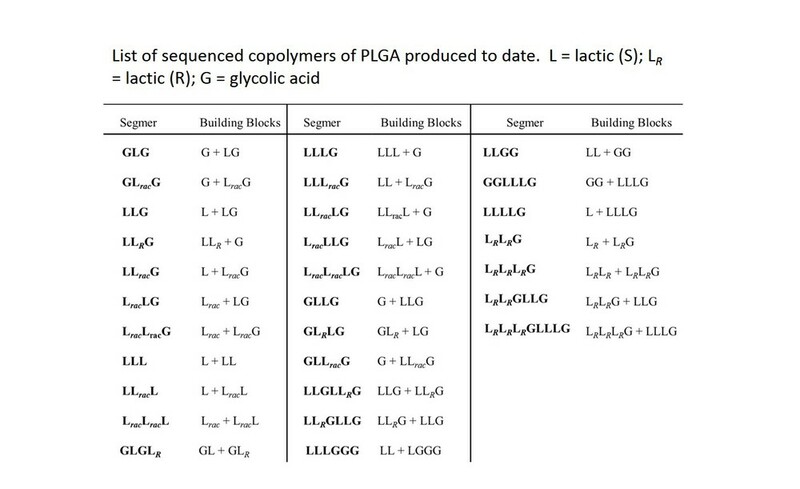 "Synthesis of Repeating Sequence Copolymers of Lactic, Glycolic, and Caprolactic Acids," Journal of Polymer Science Part a-Polymer Chemistry 2011, 49, 1847-55. DOI: 10.1002/pola.24610. Stayshich, R. M.; Weiss, R. M.; Li, J. A.; Meyer, T. Y. "Periodic Incorporation of Pendant Hydroxyl Groups in Repeating Sequence Plga Copolymers," Macromolecular Rapid Communications 2011, 32, 220-25. DOI: 10.1002/marc.201000608. Li, J.; Stayshich, R. M.; Meyer, T. Y. 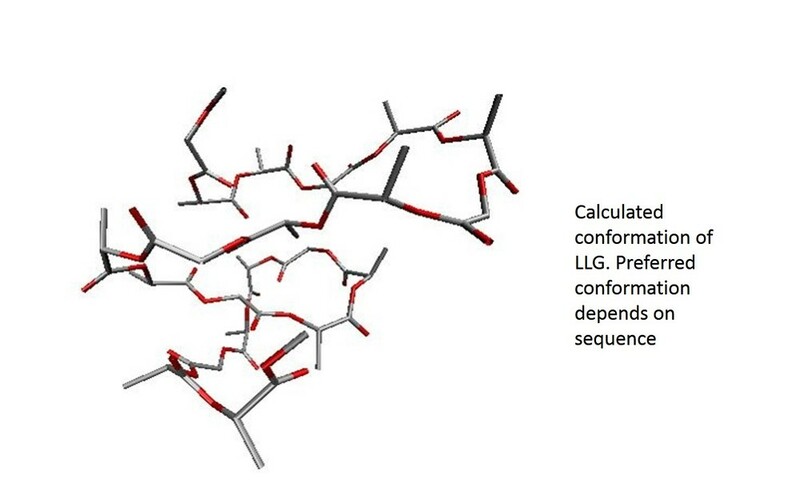 "Exploiting Sequence to Control the Hydrolysis Behavior of Biodegradable Plga Copolymers," Journal of the American Chemical Society 2011, 133, 6910-13. DOI: 10.1021/ja200895s. Stayshich, R. M.; Meyer, T. Y. "New Insights into Poly(Lactic-Co-Glycolic Acid) Microstructure: Using Repeating Sequence Copolymers to Decipher Complex Nmr and Thermal Behavior," Journal of the American Chemical Society 2010, 132, 10920-34. DOI: 10.1021/ja102670n. Stayshich, R. M.; Meyer, T. Y. "Preparation and Microstructural Analysis of Poly(Lactic-Alt-Glycolic Acid)," Journal of Polymer Science Part a-Polymer Chemistry 2008, 46, 4704-11. DOI: 10.1002/pola.22801. The Meyer Group is interested in exploiting sequence as a tool to tune optoelectronic and bulk properties of organic semiconducting molecules. Our group works on synthesizing and characterizing conjugated systems with common building units such as phenylene-vinylene or benzothiadiazole. By altering the sequence, the conjugated oligomers exhibit changing of HOMO-LUMO levels, band gaps or packing behavior. Zhang, S. P.; Bauer, N. E.; Kanal, I. Y.; You, W.; Hutchison, G. R.; Meyer, T. Y., Sequence Effects in Donor-Acceptor Oligomeric Semiconductors Comprising Benzothiadiazole and Phenylenevinylene Monomers. Macromolecules 2017, 50 (1), 151-161. Zhang, S. P.; Hutchison, G. R.; Meyer, T. Y., Sequence Effects in Conjugated Donor-Acceptor Trimers and Polymers. Macromolecular Rapid Communications 2016, 37 (11), 882-887. Bischof, A. M.; Zhang, S. P.; Meyer, T. Y.; Lear, B. J. "Quantitative Assessment of the Connection between Steric Hindrance and Electronic Coupling in 2,5-Bis(Alkoxy)Benzene-Based Mixed-Valence Dimers," J. Phys. Chem. C 2014, 118, 12693-99. DOI: 10.1021/jp504887s. Norris, B. N.; Zhang, S. P.; Campbell, C. M.; Auletta, J. T.; Calvo-Marzal, P.; Hutchison, G. R.; Meyer, T. Y. "Sequence Matters: Modulating Electronic and Optical Properties of Conjugated Oligomers Via Tailored Sequence," Macromolecules 2013, 46, 1384-92. DOI: 10.1021/ma400123r. Norris, B. N.; Pan, T. Q.; Meyer, T. Y. "Iterative Synthesis of Heterotelechelic Oligo(Phenylene-Vinylene)S by Olefin Cross-Metathesis," Organic Letters 2010, 12, 5514-17. DOI: 10.1021/ol102398y. Oxley, D. S.; Walters, R. W.; Copenhafer, J. E.; Meyer, T. Y.; Petoud, S.; Edenborn, H. M. "Mono- and Terfluorene Oligomers as Versatile Sensitizers for the Luminescent Eu3+ Cation," Inorganic Chemistry 2009, 48, 6332-34. DOI: 10.1021/ic9002324. Copenhafer, J. E.; Walters, R. W.; Meyer, T. Y. "Synthesis and Characterization of Repeating Sequence Copolymers of Fluorene and Methylene Monomers," Macromolecules 2008, 41, 31-35. DOI: 10.1021/ma0703711. Using redox chemistry, the mechanical properties of electroplastic elastomers (EPEs) can be switched reversibly between hard and soft states by reducing or oxidizing the metal crosslinker. Differentiating from other reversible materials, EPEs maintain their three-dimensional shape throughout the entire transition, demonstrating striking shape memory properties and allowing for a wider range of potential applications. 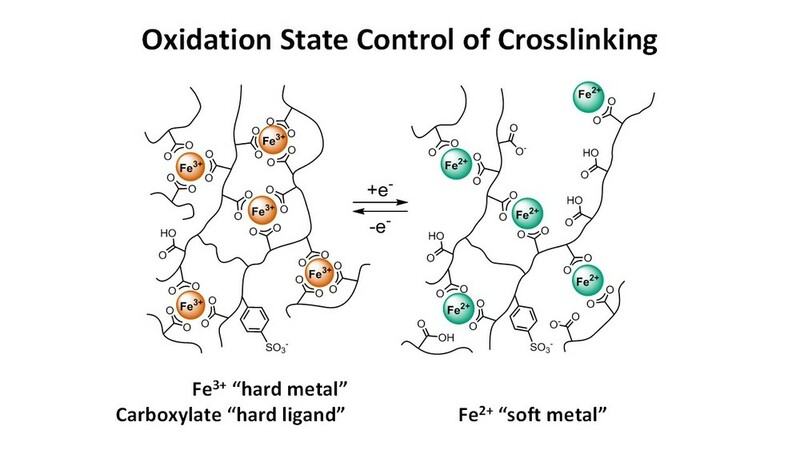 We are currently exploring the nature of metal crosslinking to better understand the transition between hard and soft states. Auletta, J. T.; LeDonne G. J.; Gronborg, K. C.; Ladd, C. D.; Liu, H. T.; Clark, W. W.; Meyer, T. Y.; Stimuli-Responsive Iron-Cross-Linked Hydrogels That Undergo Redox-Driven Switching between Hard and Soft States; Macromolecules 2015, 48 (6), 1736-1747. Hui, L. W.; Piao, J. G.; Auletta, J.; Hu, K.; Zhu, Y. W.; Meyer, T.; Liu, H. T.; Yang, L. H. "Availability of the Basal Planes of Graphene Oxide Determines Whether It Is Antibacterial," ACS Appl. Mater. Interfaces 2014, 6, 13183-90. DOI: 10.1021/am503070z. Harris, R. D.; Auletta, J. T.; Motlagh, S. A. M.; Lawless, M. J.; Perri, N. M.; Saxena, S.; Weiland, L. M.; Waldeck, D. H.; Clark, W. W.; Meyer, T. Y. "Chemical and Electrochemical Manipulation of Mechanical Properties in Stimuli-Responsive Copper-Cross-Linked Hydrogels," ACS Macro Letters 2013, 2, 1095-99. DOI: 10.1021/mz4004997. Calvo-Marzal, P.; Delaney, M. P.; Auletta, J. T.; Pan, T. Q.; Perri, N. M.; Weiland, L. M.; Waldeck, D. H.; Clark, W. W.; Meyer, T. Y. "Manipulating Mechanical Properties with Electricity: Electroplastic Elastomer Hydrogels," Acs Macro Letters 2012, 1, 204-08. DOI: 10.1021/mz2001548. "Palladium Catalyzed Regio- and Stereoselective Four-Component Coupling Reaction" Daniel J. Knapton and Tara Y. Meyer, Journal of Organic Chemistry, 2004, 785-796. “The Stereoselective and Catalytic One Pot Synthesis of β-Selenyl Acrylamides.” Daniel J. Knapton and Tara Y. Meyer, Organic Letters, 2004, 6, 687-689. “Iminophosphorane Mediated Imine Metathesis.” Matthew C. Burland and Tara Y. Meyer, Inorganic Chemistry, 2003, 42, 3438-3444. “Ortho, Para-Polyaniline: A New Form of a Classic Conducting Polymer.” Rachel E. Ward and Tara Y. Meyer, Macromolecules, 2003, 36, 4668-4373. “Dichloro(isopropylamido)bis(isopropylamine)(isopropylimido)-tantalum(V), a monomeric Ta-V compound with imido, amido and amino moieties.” Matthew Burland, Tara Y. Meyer, and Steven J. Geib, Acta. Cryst. Part C., 2003, 59, M46-M48. “The Role of Trace Amine in the Metathesis of Imines by CpTa(=NR)Cl2.” Matthew Burland, Timothy W. Pontz and Tara Y. Meyer, Organometallics, 2002, 21 1933-1941. Steven J. Geib, Acta Cryst. Part C, 57, 2001, 1341-1342. “Iminophosphorane-Mediated Carbodiimide Metathesis.” Stephen A. Bell, Steven J. Geib, and Tara Y. Meyer, J. Chem. Soc., Chem. Commun. 2000, 1375-1376. “Ring-Opening Metathesis of Pyrroline.” GidgetK. Cantrell, Steven J. Geib, and Tara Y. Meyer, Organometallics, 19, 2000, 3562-3568. “Ring-Opening Metathesis of a Cyclic Imine: The First Step in Imine ROMP.” Gidget K. Cantrell, Steven J. Geib, and Tara Y. Meyer, Organometallics 1999, 18, 4250-4252. “C-H Activation of Pendant Alkoxides by Tungsten Imide Complexes.” Amy Y. Jordan and Tara Y. Meyer, J. Organomet. Chem. 1999, 591, 104-113. “The Synthesis and Olefin Reactivity of Neutral and Cationic Tantalum Amidinate Pentamethylcyclopentadienyl Complexes.” Jolene M. Decker, Steven J. Geib, and Tara Y. Meyer, Organometallics 1999, 18, 4417-4420. “Ph2PCl3: Covalency in Solution and the Solid State.” Stephen A. Bell, Steven J. Geib, and Tara Y. Meyer, Inorg. Chem. 1999, 38, 2524-2526. “Catalytic C=N Bond Formation by Metal-Imide-Mediated Imine Metathesis.” Gidget K. Cantrell and Tara Y. Meyer, J. Am. Chem. Soc., 1998, 32, 8035-8042. “Organic/Fluorous Phase Extraction: A New Tool for the Isolation of Organometallic Complexes.” Nikolaos Spetseris, Sabine Hadida, Tara Y. Meyer, and Dennis P. Curran, Organometallics, 1998, 17, 1458-1459. “Linear and Hyperbranched meta-Polyaniline.” Nikolaos Spetseris, Rachel E. Ward, and Tara Y. Meyer, Macromolecules, 1998, 31, 3158-3161. “Transition-Metal-Catalyzed Imine Metathesis.” Gidget K. Cantrell and Tara Y. Meyer, Organometallics, 1997, 16, 5381-5383. “Azaheteroalkene Metathesis: The Reaction of Imines with Molybdenum(VI) Bis(imide) Complexes.” Gidget K. Cantrell and Tara Y. Meyer, J. Chem. Soc., Chem. Commun., 1997, 1551-1552. “Silica as a Ligand: The Reactivity of the Iridium-Oxygen Bond of Cp*Ir[silica](Ph)(PMe3).” Tara Y. Meyer, Keith A. Woerpel, Bruce M. Novak, and Robert G. Bergman, J. Am. Chem. Soc., 1994, 116, 10290-10291. “Coordination of CB11H12- to Cationic Zr(IV) Complexes. Synthesis and Structures of (C5H5)Zr(h2-CH2Ph)(CB11H12), (C5H4Me)Zr(CH3)(CB11H12), and (C5Me5)Zr(CH3)2(CB11H12).” Donna J. Crowther, Samuel Borkowsky, Dale Swenson, Tara Y. Meyer, and Richard F. Jordan, Organometallics, 1993, 12, 2897-2903. “Reduction of an Electronically Unsaturated Transition Metal h2-Acyl Complex. Arene Formation from Deoxygenative Acyl Coupling with a Cyclopentadienyl Ligand.” Tara Y. Meyer and Louis Messerle, J. Am. Chem. Soc., 1990, 112, 4564-4565. “Alkyl Group Effects on CO Insertion into Coordinatively Unsaturated Early Transition-Metal Alkyls. Preparations and the First Structural Characterizations of Tantalum Enolate- and Tantalum h2-Acyl Complexes.” Tara Y. Meyer, Lelia R. Garner, Norman C. Baenziger, and Louis Messerle, Inorg. Chem., 1990, 29, 4045-4050. “Equilibrium and Kinetic Studies of Monoaquo Complexes of Platinum(II) 2. Dimerization of Pt(dien)(H2O)2+.” Luther E. Erickson, Hans L. Erickson, and Tara Y. Meyer Inorg. Chem., 1987, 26, 997-999.